Hydraulic bench presses are primarily designed to be able to remove gears, bushings, pulleys, bearings, U-joints, ball joints and other sorts of metal forming work. These hydraulic bench presses work by lowering the bench-mounted ram press with generally around 10 tons of force for forming and pressing (Source). Users often opt for these benchtop hydraulic presses when they don't have room for four-mounted options. The 10 ton Drake hydraulic bench press is our top pick- it is a 132 pound press that measures 36" x 23" x 18", and is a bit less than 17" between the upright rails. It ships with a pair of interchangeable ram noses, one of them a flat nose for standard pressing and then one that is a step-reduced nose for positioning and sitting during pressing. Users are generally satisfied with this Drake press- writing that though it is made in China the quality is pretty good, especially for the price. It's advised that you download the instruction manual from the Drake website rather than rely on the translated instructions received with the press itself. Many users describe that is ideal for automotive applications and general home shop use. All of that said, let's take a look at five of the best-selling hydraulic bench presses on the market today and see how they compare. 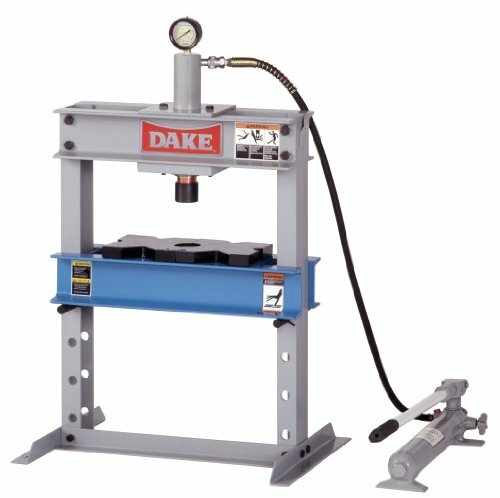 The Dake B-10 Hydraulic Bench Press is a single-speed hydraulic hand pump that can bench mount press up to ten tons of force. Many buyers like that this hydraulic bench press has an adjustable height table inside of its H-frame that allows for proper positioning of larger and bulkier items. Many users also like the nice feature of a movable workhead that helps to facilitate off-center pressing. Some nice features include its flat ram nose, a reduced step nose, as well as two table plates that help for more precise bench pressing as well as support. This particular hydraulic bench press is great for the user who simply doesn’t have enough room in their garage or work area for a floor-mounted hydraulic bench press. Some users didn’t like that you had to put a lot of the hydraulic bench press together on your own- and the instructions were not too clear on how to do that. Otherwise, most users found this a pretty good hydraulic bench press, especially for the price. This Central Hydraulics hydraulic bench press is a six-ton bench press that with users saying that the A-frame is quite strong, especially for this type of design. 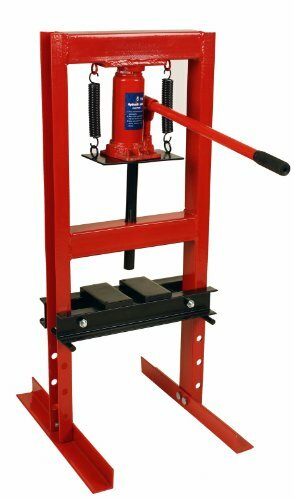 This hydraulic bench press is specifically designed for general purpose work- such as in a machine shop, auto shop or in the workshop of a novice hobbyist. Most reviewers feel that it is a well-designed hydraulic bench press, and works quite well, but the instruction manual that comes with it was basically useless. Luckily most users say that it isn’t that difficult- if you look closely at the picture you can pretty much figure out how to put it together. Several users have complained that when they received their Central Hydraulics 6 Ton A-Frame Bench Shop Press that it was missing bolts and screws- but that was easily remedied by contacting its sellers. But, for those who had no parts issues found that for the price this hydraulic bench press does what it claims to do. The Grizzly 10 Ton Bench Top Shop Press has a vertically mounted hydraulic pump as well as a pressure gauge for more precise pressure. Many users like this feature as well as the three different adjustable bed locations that it offers. Users like that this hydraulic bench press is compact and was actually very easy to put together. Another feature many users have found helpful is the pressure gauge and how it is vertically mounted- making it a lot easier to operate. Reviewers endorse how compact it is- making it quite easy to find a place for it in a smaller work area like a small garage or basement workshop. There were a few customers that had issues with parts being missing upon arrival or damaged goods mainly due to poor packaging for shipping. This 6-Ton, Hydraulic Bench Top Shop Press is a hydraulic press that comes with its own press plates and has a strong ability to remove and install bushings along with bearings, gears, ball joints, U-joints, pulleys and gears. Many reviewers like its open-sided construction, which makes it a lot easier to work on longer pieces. They also commend the bolted, adjustable cross-beams because it makes it a lot easier to raise and lower it- so you can get just the right working distance you need for any particular job. 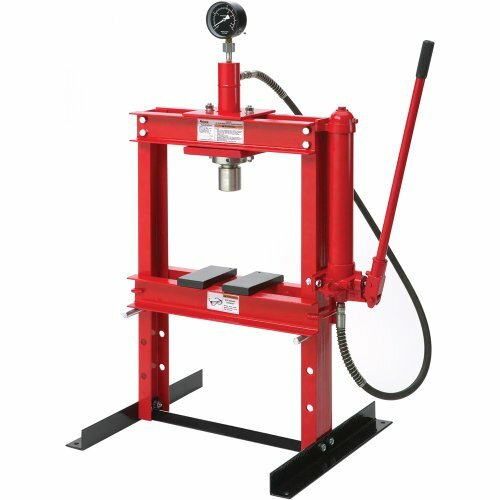 This hydraulic bench press is made of sturdy tube-steel and has a plate bar that measures 10” x 1” which is ideal for bearings and bushings- and it comes with two of its own press plates, a nice feature users applaud. Many reviewers describe this hydraulic bench press as high-quality and that it works at a commercial shop level, but comes with a price that the hobbyist will enjoy. Some users were disappointed in the quality of the springs on the press as well as how easily the paint flaked off the hydraulic bench press. This Black Bull hydraulic bench press has some nice features that many users commend- such as its spring-return press beam, two press plates and has a 12,000 lb. capacity. They also like that the adjustable table that has two different settings, enhancing its ease of operation. This particular bench press was commended by its buyers for installing and removing bearings, gears, U-joints, ball joints, pulleys and bushings. Reviewers like the powder-coating on the machine, which gives it an attractive appearance in workshops, as well as how little space it takes up. Some users found it a little difficult to assemble because if it is not done carefully it can be assembled crooked and then the machine will end up be wobbly. Users also didn’t like that it requires full, rather than part, assembly. Once assembled, however, most users have found that this hydraulic bench press works well without any nagging, long-term issues. Hydraulic bench presses generally include the hydraulic hand pump, and adjustable-height table contained within an H-frame, movable workheads, safety-enabled release valves, flat ram noses, table plates and reduced-step noses. Hydraulic benchpresses also feature open-sided designs that let you work on long pieces- with heavy-duty springs enabling you to quickly return the ram to position. 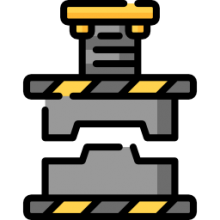 The way hydraulic bench presses work is that they use fluid pressure to assert a highly compressive force that remains consistent all the way through the ram's press. 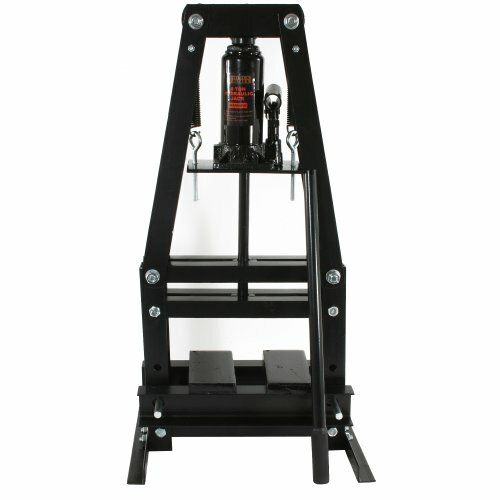 If you're interested in purchasing a manual hydraulic bench press with a 4, 6 or 10 ton capacity press, check out our comparison table on this page, read our individual product reviews, and also check out the individual product pages to see what other consumers are saying about the models that they have purchased.